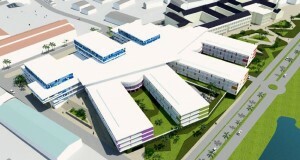 WILLEMSTAD – The debenture loan for the new hospital, Hospital Nobo Otrabanda, is a fact. The entire project will cost about 400 million guilders. This amount will be paid by the development organization Usona. This will not happen at once, but in parts. The Committee for Financial Supervision (CFT) will execute control over how the money is spent. This is according to Usona’s information executives, Esmeralda Wiel and Dito Garmers. Garmers indicated that the construction of the new hospital will take another three years. Ballast Nedam is in charge with the construction of the new hospital. Nedam has been in a negative spotlight lately because apparently they have committed fraud. Garmers says that all necessary documents were requested, which allows the organization to see if a contractor meets the requirements or not. Thus the proof of good conduct was requested several times. “You cannot speculate, but you go on facts, which were positive,” Garmers stated.